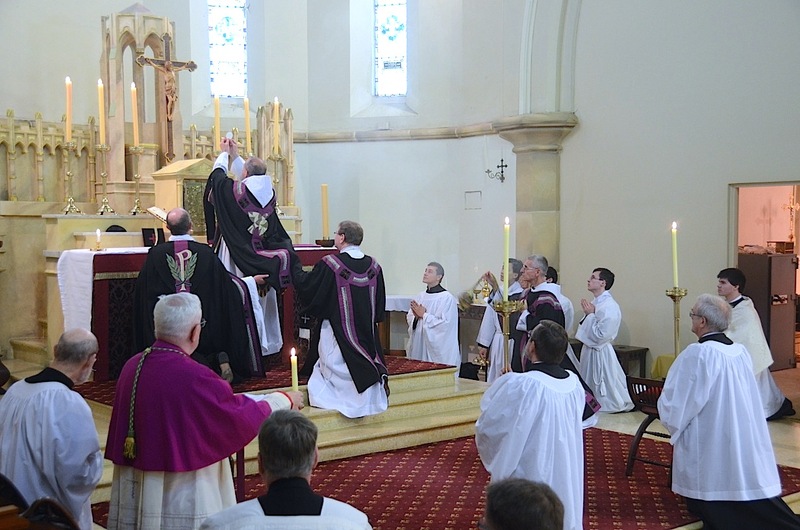 Article: "Can Theology and Liturgy be Divorced?" 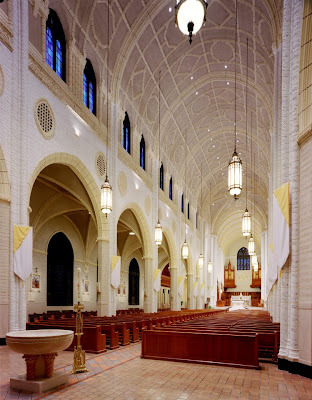 A large part of the credit for the revival of great liturgical music in the Catholic world goes to the existence and persistence of the Sacred Music Colloquium as sponsored by the Church Music Association of America. The Colloquium gathers again this year, in Salt Lake City, Utah (USA), June 17-23. It features world-class chant teachers and excellent polyphony conductors, plus an environment of hard work and fun that opens up new possibilities for the musical arts to thrive. Truly, it can be a life changing experience. You don't have to have experience as a chanter to be here. There are classes on the basics, refreshers courses, and plenty of material for advanced singers too. The entire conference can accommodate 250 attendees. It ends up filling up ever year but there is still space right now. You can register here. And by the way, the CMAA is run on a shoestring budget with mostly volunteers. The existence of this event is a tribute to what passion and dedication can accomplish even in the face of seemingly insurmountable odds. We would love for you to join us this year. 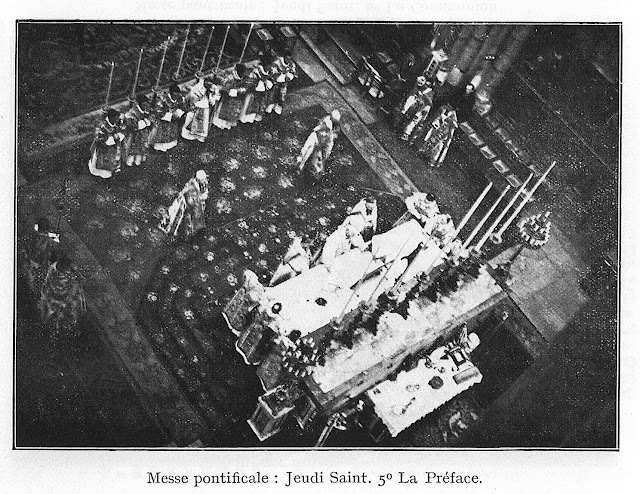 I have shown some of these photos before here, some in relation to an article I did on the Pontifical form of the Lyonese rite in 2010, and another in one of our quizzes, but I have never shown them all, nor all at once, so here they are. Veterum Sapientia is an intensive week-long ecclesiastical Latin program largely for, but not exclusive to, priests, religious, and seminarians. It will take place at Belmont Abbey College outside Charlotte, NC this August 4-10. It will offer a unique, guided exploration of the most important categories of writing that make up the Church’s Latin patrimony, with exercises ordered toward helping participants grow in their understanding of the mechanics of the language and internalize new vocabulary through active use. Classes and related activities (e.g. meals, games, walks) will be conducted in Latin and in a combination of Latin and English, as appropriate to participants’ level of experience. Plenary class sessions and some small-group work will be devoted to reading and discussion of texts representing the major genera of Latin writing in the life of the Church: scriptural Latin, patristic Latin, liturgical Latin, scholastic Latin, ecclesiastical (curial) Latin, and Gregorian chant (hymns). In other small-group sessions, participants will be guided through active exercises in speaking and in simple writing, based on material from these representative texts. Participants will experience a series of plenary and small-group classes for a minimum total of six hours of instruction daily. Common lunches, dinners, and evening recreational activities will also be provided, offering opportunities for informal conversation in Latin to those who wish to participate. All class sessions, common meals and recreational activities will be conducted on the Belmont Abbey College campus; participants’ lodging will be off-campus (see area hotel information below). We've been blessed with an extraordinary staff. Fr. Reginald Foster will be the head instructor. He was the chief Vatican Latinist for nearly 40 years and is arguably the best Latinist in the world. 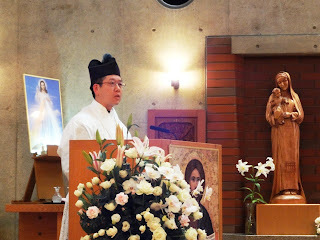 Assisting him we have his successor in the Vatican Latin office, Msgr. Dan Gallagher, Dr. Nancy Llewellyn of Wyoming Catholic College who's quite well-known in the spoken Latin circuit, and Dr. Gerald Malsbary at Belmont Abbey College. 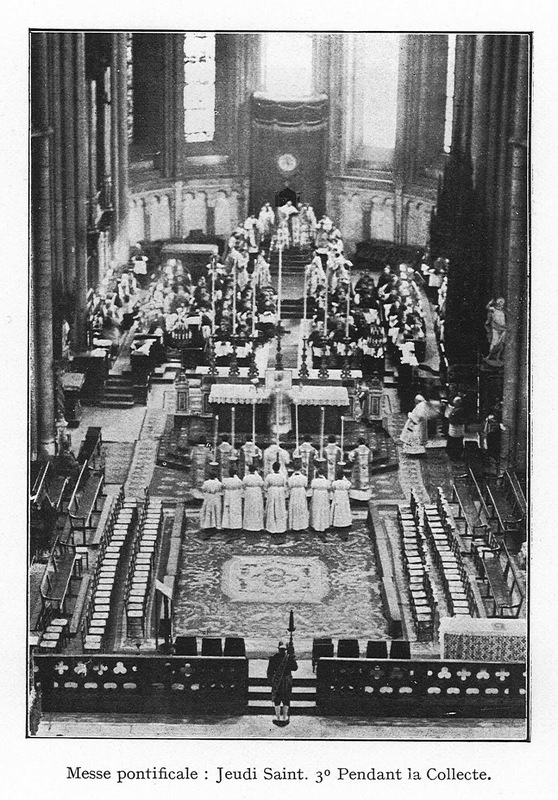 Veterum Sapientia was an Apostolic Constitution signed on the high altar of St. Peter's by Blessed John XXIII. Its goal was to restore and revitalize the Latin language in the Church. Since it was signed a mere six months before Vatican II, it has been largely ignored for the past 50 years. Now more attention is being given to the document and this program hopes to respond to it. Register now. Deadline for registration is June 1st. 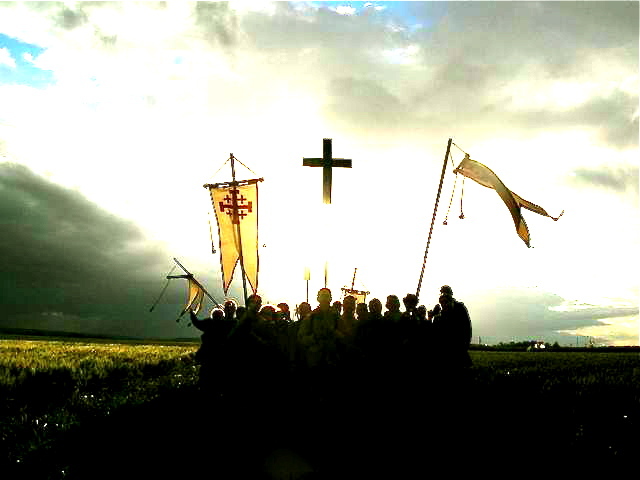 Recently it came mind that we are fast approaching the annual Chartres Pilgrimage (see above) which, this year, will take place from May 18-20th. In the same vein, we have often reported on other pilgrimages which have been inspired by the Chartres Pilgrimage, including one in Michigan. 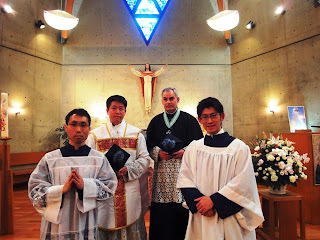 We had a great deal of interest in our post related to the usus antiquior in Japan, and so readers might be interested in the following which show photos from an EF Mass offered at St. Viator Kitashirakawa in beautiful Kyoto -- a shrine 26 Japanese martyrs -- on April 14th. 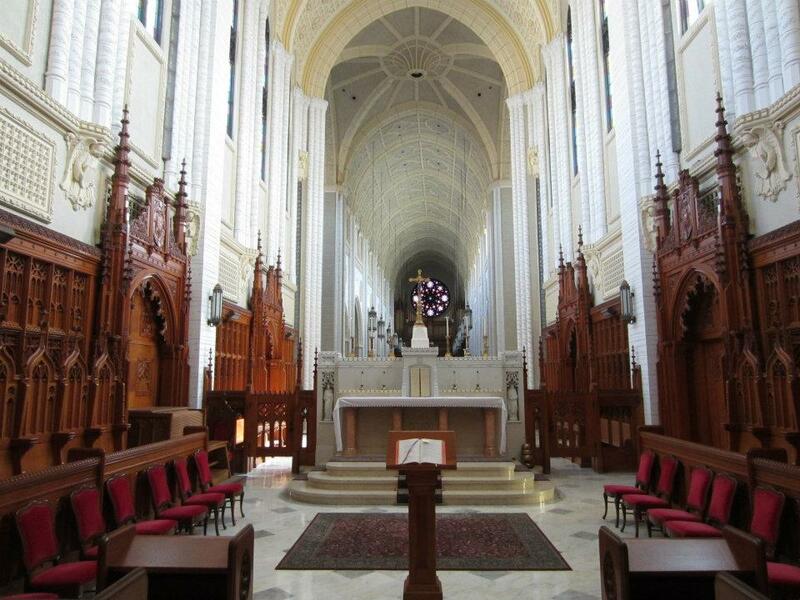 Some photos of the recently finished Dominican house chapel in Lviv. The iconography is quite exquisite. Thanks to Fr. Lawrence Lew, OP, for bringing it to my attention. Here are some photos of a Solemn Requiem Mass offered for deceased servicemen on April 25th by the Dom Philip Anderson, OSB (Abbot of Clear Creek Abbey in Tulsa, Oklahoma) which was offered in Melbourne, Australia and the Catholic Community of Blessed John Henry Newman. Bishop Peter J. Elliott was in choir. A full photo set is available here. Following the excellent feature introduced by Shawn Tribe - The Sacred Liturgy and the Apostolate - on how liturgy is the 'indespensable' source of momentum for increased charity and social and cultural regeneration, I thought that I would consider the part that sacred art and the beautiful decoration of our churches have to play in this. St Francis of Assisi is the figure to whom are encouraged to look in this regard, so perhaps the easiest way to think about this is to consider the effect he had in his day. 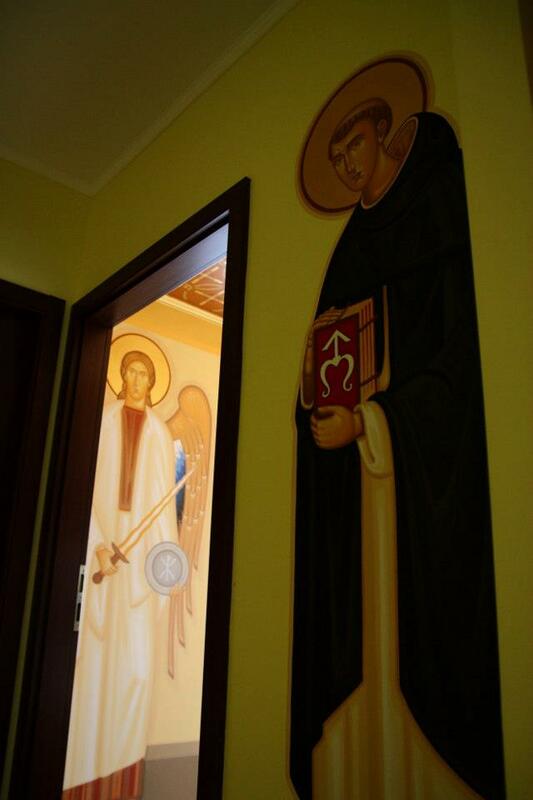 I am no expert on St Francis himself and I am acutely aware that Fr Thompson a fellow contributor to this site is, so I will take a cautious approach. I am working on a couple of simple assumptions that I am hoping are reasonable: that a focus on charity and concern for poor and the art of third order Franciscans artists are all reflective of the Franciscan spirit of the age; and these are consistent with the spirituality of St Francis himself. 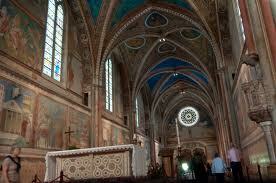 The artists are those such as Giotto, Cimabue and the anonymous artist known as the 'Master of St Francis'. There are a number of points that can be made about the art. Just looking at the interiors of these churches one can say that there is huge importance attached to their beauty and harmony with the liturgy. But it goes further than that. They are highly innovative. 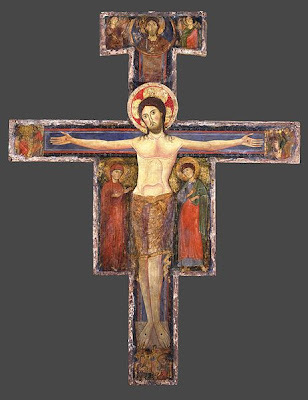 Features such as the increased naturalism and heightened sense of the suffering of Christ represented a departure from the strict iconographic prototype that governed the art of period before. 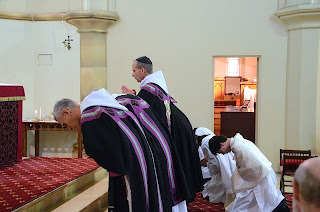 However, although innovative the always worked within the broader the principles of what makes art worthy of veneration and it is therefore authentic sacred art that deepens our participation in the liturgy. There is no accounting for how God might choose to inspire individual artists, but it does not seem conceivable to me that a whole culture changing movement which is for the good, (which is what we are talking about here), could happen without a deep attachment to the liturgy. 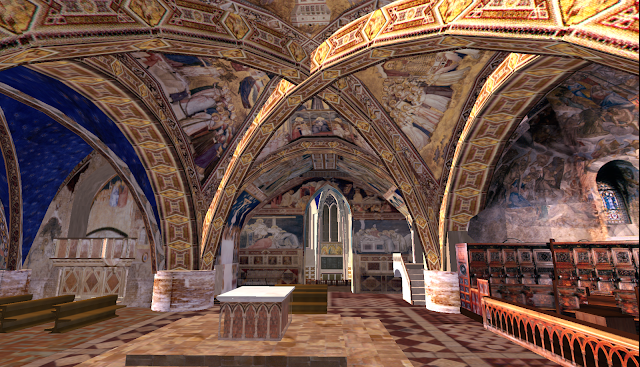 If we look at the interiors of the churches, for example, notice how much is adorned with geometric patterned art. This suggests to me an deep awareness of the sources of the symbolism that generates such geometry, predominantly scripture and the cosmos. 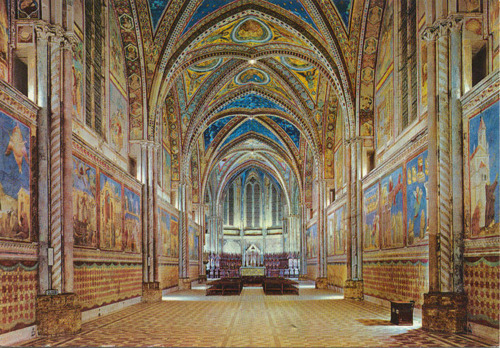 One of the commonly held ideas of Franciscan spirituality is that of an interest in and love of the beauty of the natural world that St Francis inspired. Whatever the truth of this, I would say that as a general principle one could not create such 'cosmic' art unless one was able to read the cosmos symbolically and had a deep understanding of how that symbolism and the beauty of the cosmos points us to something greater, to the rhythms of the heavenly liturgy and ultimately to God. To the degree that all of this inspires a true liturgical devotion, then, as Shawn's feature points out, this will inspire devotion also to charity for the poor. In addition, one should say that he needs of the poor are spiritual as well as material. The poor need their souls saving just as much as the rich do and this art is for all people, rich and poor. 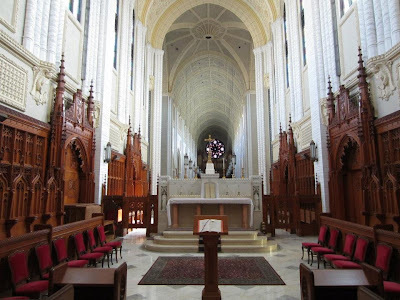 To my mind, all of this beauty is consistent with the twin aims that I have heard Pope Francis speak of rebuilding the Church - evangelisation - and caring for poor. When one relies on God we rest in an infinite and superabundant source of all that is good (including wealth). Inspiring people, rich and poor alike to come closer to God will create benefits in every area of our lives. I have written in more detail about this in an article on my blog (Should We Sell All the Art in the Vatican and Give the Money to the Poor?). 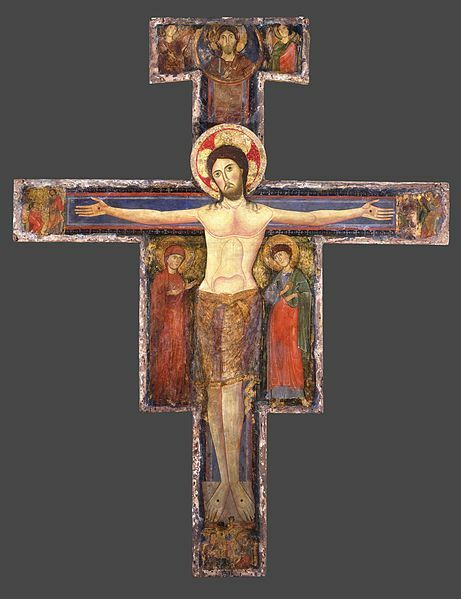 Above: a crucifixion by Cimabue contrasted with an iconographic (Romanesque) cross painted in Umbria in the 12th century. 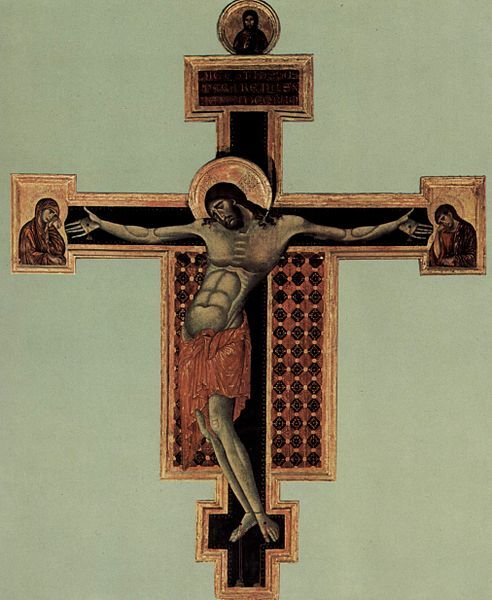 The former focusses on the suffering of Christ, while the latter on his glory on the cross. Below: St John and Our Lady during the Passion from the Master of St Francis. And finally my own version of the Franciscan gothic figures painted for the chapel at Thomas More College. 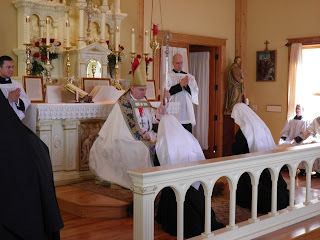 At the request of Archbishop Salvatore Cordileone the Extraordinary Form of the Roman Rite will begin to be celebrated at Star of the Sea Parish, 4420 Geary Boulevard (at 8th Avenue) in San Francisco on May 26th, Trin­ity Sunday, at 11:00 A.M. and will continue each Sunday and Holy Day on a regular basis. There is ample park­ing behind the church with entrance through the gates on 8th Avenue. 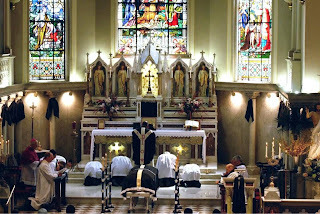 To learn more about the Extraordinary Form Latin Mass you are invited to Star of the Sea School Auditorium for meetings on Tuesdays, May 7th, May 14th, and May 21st at 7:00 P.M. For further information please contact the pastor of Star of the Sea Parish, Father Mark G. Mazza, at 415-751-0450, extension 16. 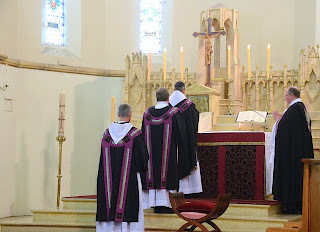 I decided to take a look at the parish, and it looks well suited to this form of the Roman liturgy indeed. Here are some photos of the sanctuary, and here is one of the exterior. As was announced last week our parish will be one of the sites in the Archdiocese for the celebration of the traditional Latin Mass. Though we have had recently donated the refurbishing of our candle sticks, we still could use a few donations to help us out. The Roman Missal of 1962 for use by the priest costs $400.00. 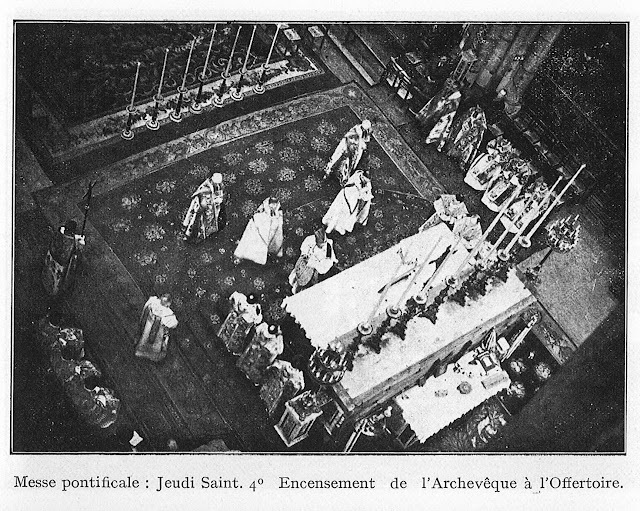 The Altar Cards cost $250.00 framed. 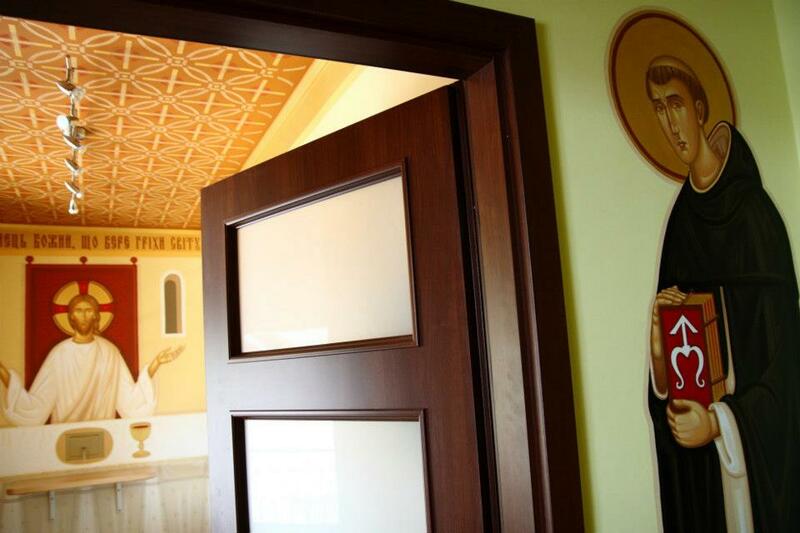 The Sanctuary Door Bell costs $790.00. We need a new censer and boat for $440.00. A holy water font for the sanctuary entrance is about $400.00. 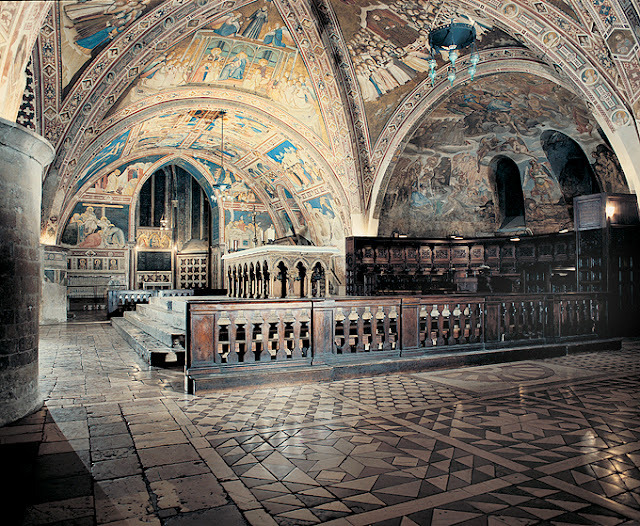 We also need to refurbish our traditional processional cross and candlesticks as well as a chalice and two ciboria. Two communion patens need refurbishing. Of course, I would point out as well that, except for the altar cards and missal -- which will be specific to the usus antiquior of course -- many of these items will also be of potential benefit to the modern Roman liturgy as well. A "win-win" as the saying goes. 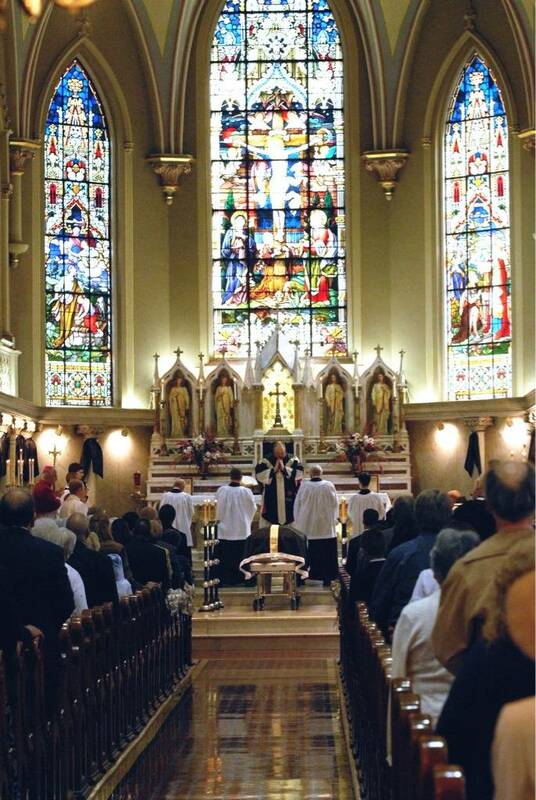 He had celebrated the Extraordinary Form of the liturgy at St. Martin's since his return to Louisville in 1996. Father was devoted to the Extraordinary Form, and celebrated it with great care and infectious devotion. 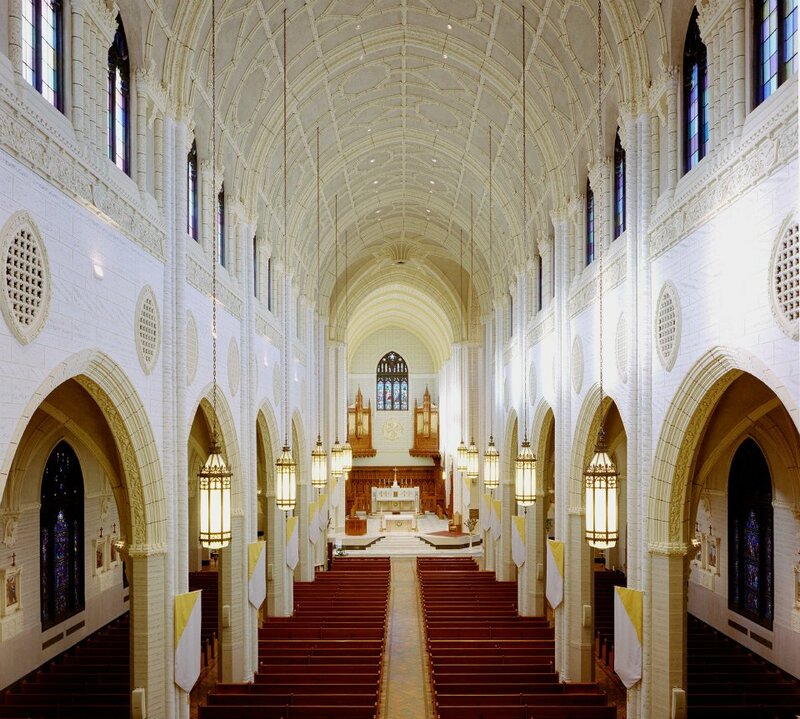 He spent his life mostly in parish ministry, but was also known for many years as a professor of Gregorian Chant at the former St. Mary's Seminary in Kentucky. 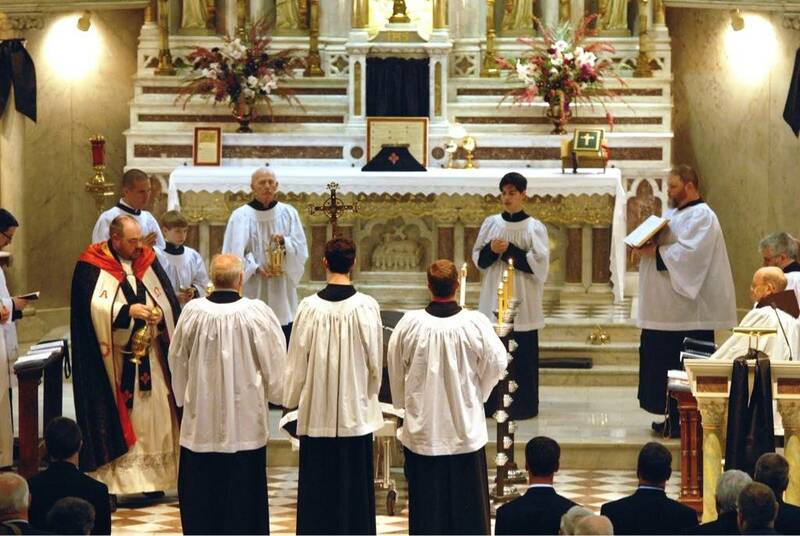 Over 400 people attended his requiem Mass, including Archbishop Joseph Kurtz of Louisville and a number of priests. In the 1961 revision of the Pontifical, the reconciliation of a violated church is definitively separated from that of violated cemetery. The latter will be treated in a separate article. 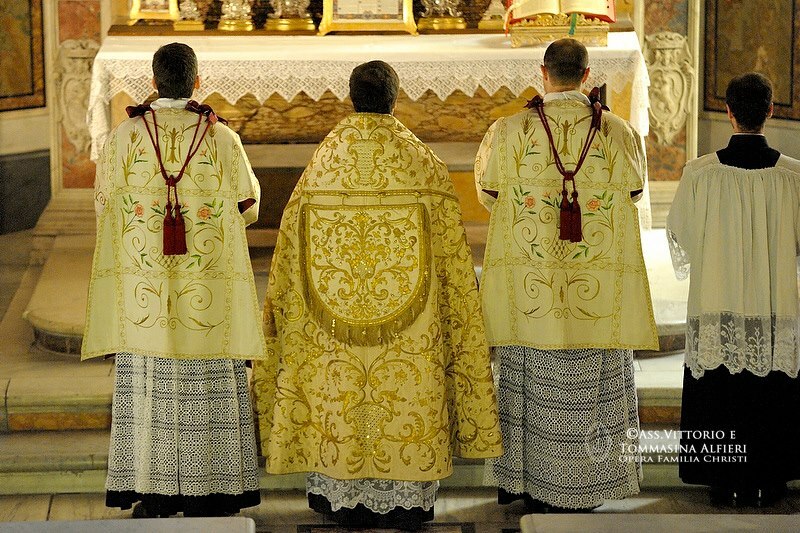 The color of the vestments worn by the bishop and major ministers is changed from white to violet. The bishop wears the mitre called “auryphrigiata” in Latin, the less ornate kind used in Advent and Lent, rather than the simple mitre with no ornamentation. The external sprinkling of the church with simple holy water is suppressed, and with it, the chant of the antiphon “Thou shalt sprinkle me” and Psalm 50 that accompanied it. 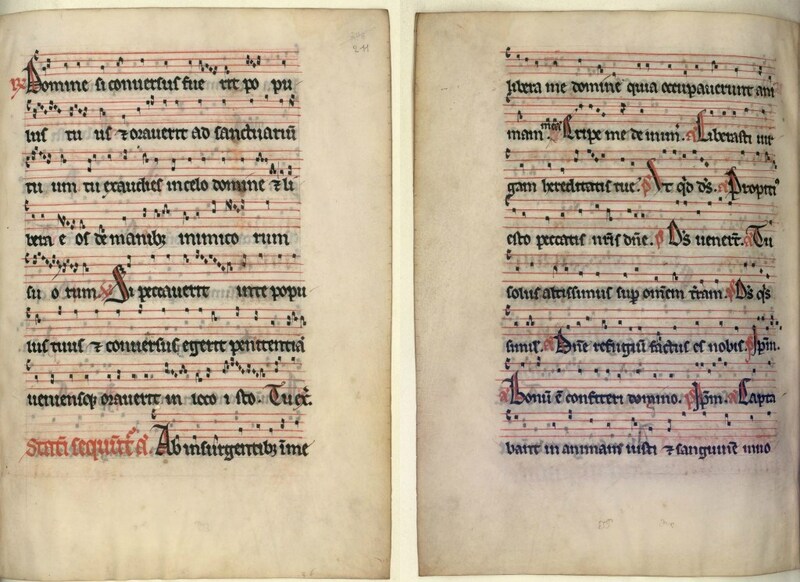 The first two prayers of the previous version of the rite are suppressed. The prayer for the violated cemetery is removed to the rite of reconciliation of a cemetery, which is now always a separate rite. The Litany of the Saints is suppressed, and with it the special invocations proper to this rite which are sung by the bishop. 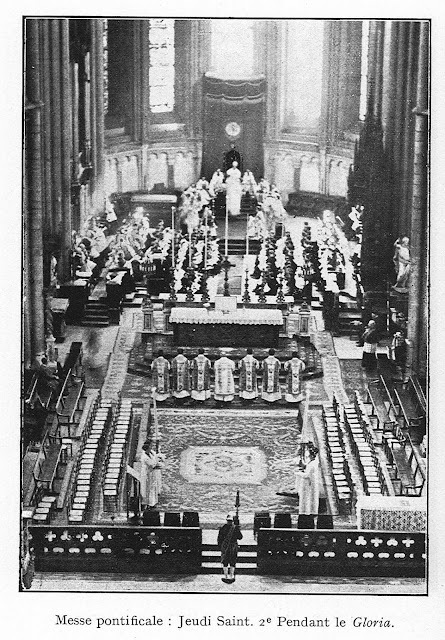 The first prayer of the ceremony (O God, who, by the Passion of Christ, Thy Son, our Lord, didst loosen the bonds of death…”) is suppressed. The ceremony begins with “Deus in adjutorium” and “Gloria Patri”, like the hours of the Divine Office, but without Alleluia. There follows at once the blessing of the Gregorian water, but the water may also be blessed before the ceremony. 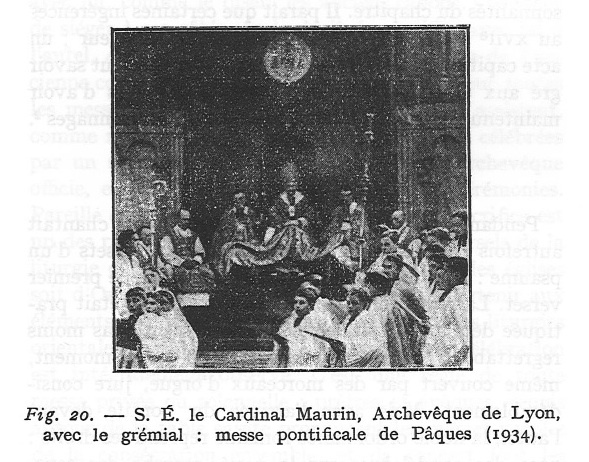 After blessing the water, or immediately after “Deus in adjutorium”, the bishop begins to sprinkle the Gregorian water, starting behind the altar, then going to his left around the church, only once (rather than three times), and saying nothing. He then sprinkles water up the middle of the church, from the altar to the door, and then from across the church, in front of the gates of the sanctuary. (The rubric does not specify left to right or right to left.) 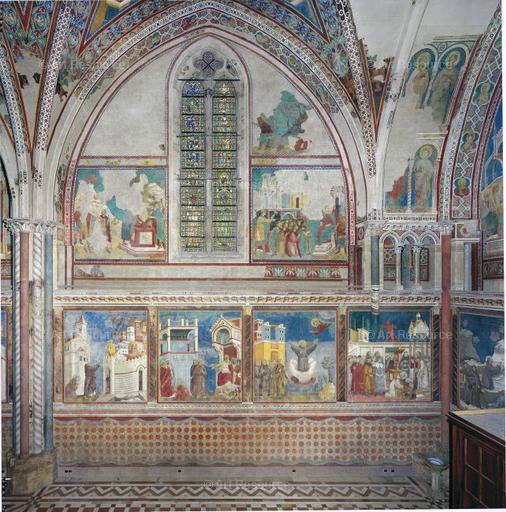 The rubrics no longer specify that the bishop sprinkles the water on the walls, or the specific place where the violation of the church took place. Dearest brethren, let us humbly beseech God, that forgiveth crimes, washeth away every pollution, God, who purified the world hardened by original sins in the glory of His coming; that He may come to us and mightily fight against the snares of the raging devil; so that whatever be stained and corrupted in this place by his cunning, that daily longs for and pursueth man’s destruction, may be cleansed by the mercy of heaven. For as it belongeth to him to break what is solid and perfect, so belongeth it to our Maker, to restore what is fallen, stay that which swayeth, and purge what is corrupted. The word ‘hardened’ marked in bold is changed from ‘corrupted’ (concretum – corruptum). The word ‘whatever” marked in bold is changed from ‘if anything’ (quidquid – si quid). Turning to the altar, the bishops says with the major ministers “Let us pray. Let us kneel. Arise.” and the following prayer. The word “henceforth” shown here in italics is omitted from the previous version. The order of the words is changed, and a single word added; neither change alters the sense. 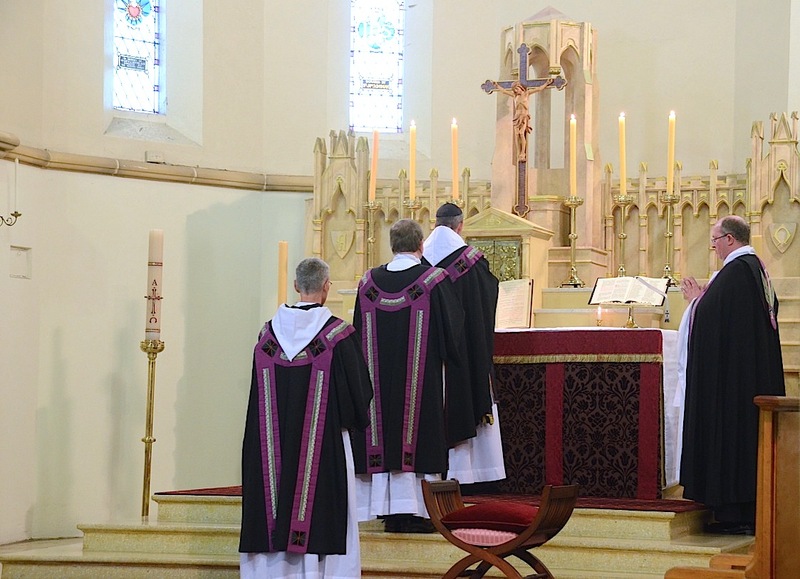 This prayer was formerly said after the singing of a psalm and antiphon, as the bishop stood at the altar, all of which was done after the preface. It is now said with the long conclusion, since it now segues into the preface dialogue and preface. Truly it is fitting and just … Whose measureless goodness, as it had no beginning, so also shall have no end. Who being full of holiness divine and natural, choose rather to restore in us what has been lost, than to smite what would otherwise perish. And if negligence polluteth anything, or wrath commit offense, or drunkenness disturb, or lust destroy, this, O Lord, Thou bearest with patience and clemency; so that Thou might purify by grace, before Thou strikest in wrath. And caring for the work Thou createst, Thou choose rather to lift up what lieth low, than to punish and condemn. We humbly beseech Thee, o Lord, that Thou may look in peace upon this Thy dwelling place, and by the infusion of heavenly grace purify Thy altar, that hath been polluted by the harm of the pursuing enemy; and having purified it, take possession thereof, and keep it hereafter that it never be stained again. Henceforth let every spiritual wickedness depart and be driven out: let the envy of the ancient serpent be destroyed, and the devil’s throng with all its deceits be driven away. Let him bear away with him the stain which he brought in, and since he is destined to eternal punishments, let him gather the seeds of his works with him, that they may perish. Let the guilt of the contamination which has now passed from this place incur no further harm, let there remain nothing which has been polluted by the fraud of the enemy, since it hath been purified by the infusion of Thy spirit. 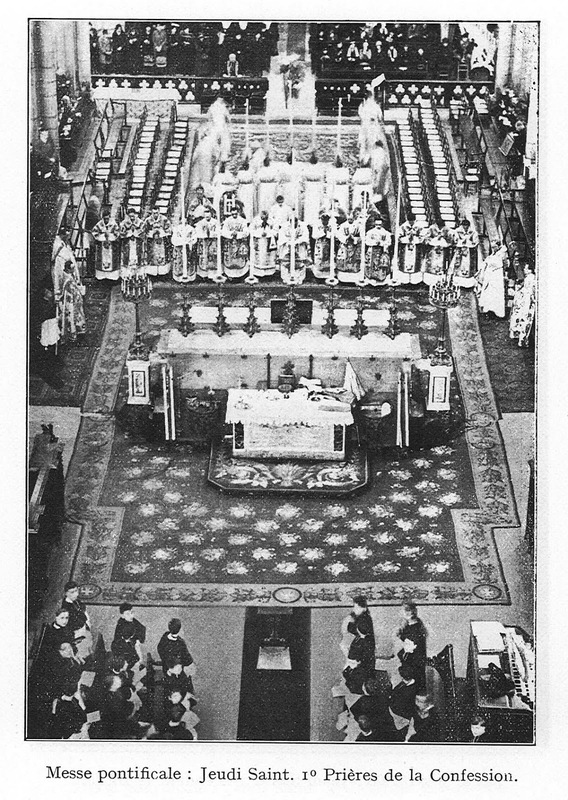 Let the pure innocence of Thy Church rise again, and the luster of innocence hitherto stained, rise again unto glory, since it hath received Thy grace: and so may the crowds of faithful peoples here assemble, and pouring forth their prayers of petition, know that they have received what they have ask for. The words in italics here are omitted from the previous version. The long conclusion is sung out loud as part of the preface, where it was previously said in a low voice. The blessing concludes with “Dominus vobiscum” and “Benedicamus Domino”. The chanting of Psalm 42 and the antiphon “I will go forth” is suppressed. The antiphon “Confirm o God” is suppressed; the psalm with which it was sung is now used during the sprinkling of the water. The concluding prayer is suppressed. 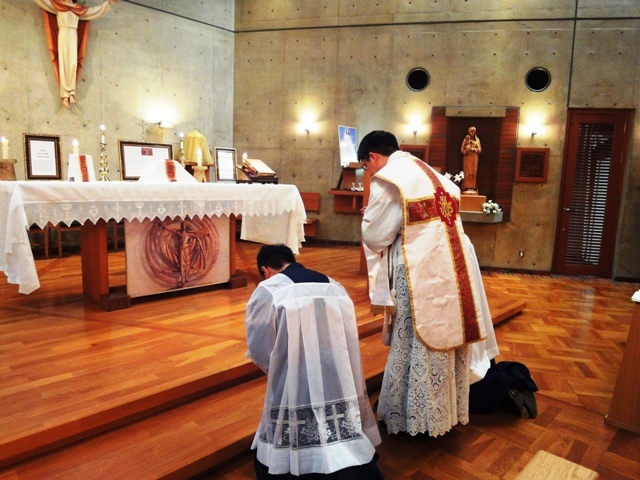 The Mass which follows the blessing is now optional, where it was formerly required. (“…juxta opportunitatem, Pontifex vel alius sacerdos Missam celebrat.”) As previously, the bishop may say the Mass himself, or he may delegate another priest to say it in his stead. 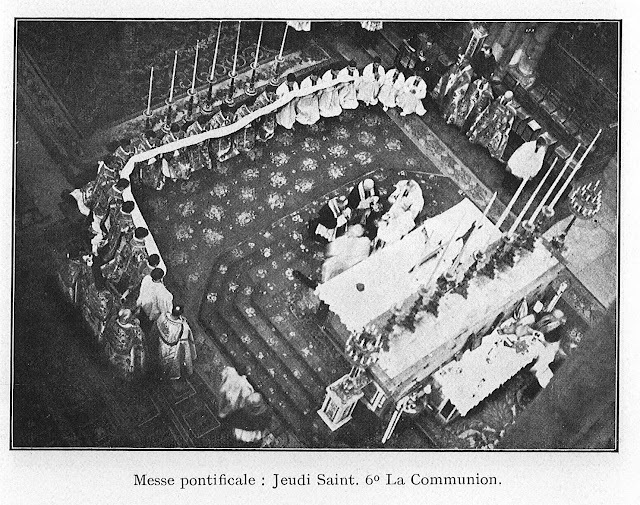 The proper prayers to be added to the Mass of the day for the occasion are no longer included in the text of the Pontifical, and are now found in the 1961 edition of the Missal itself. 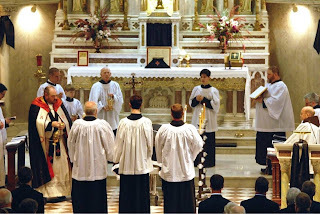 A new set of rubrics concerning the Mass itself is added, which says that the Introit is sung “juxta opportunitatem – according to convenience, fitness, opportunity”, as the celebrant approaches the altar. This seems to imply that it may be omitted, but is quite vague. All the prayers before the altar are to be omitted, and the Mass begins with the celebrant kissing the altar and incensing it. The Last Gospel is omitted. This same rubric is added to other ceremonies of the Pontifical, as has already been mentioned apropos of the dedication of a church. It should also be noted that the new ceremony is conformed almost exactly to the 1961 form of the blessing of a cemetery, to such a degree that I was able write this article in about a thirty minutes by copying the previous article on the blessing of a cemetery, and pasting the appropriate texts into their proper places. Earlier this month, two Sisters of the Benedictines of Mary, Queen of Apostles made their First Profession at The Priory of Our Lady of Ephesus, in the Diocese of Kansas City-St. Joseph, Missouri. 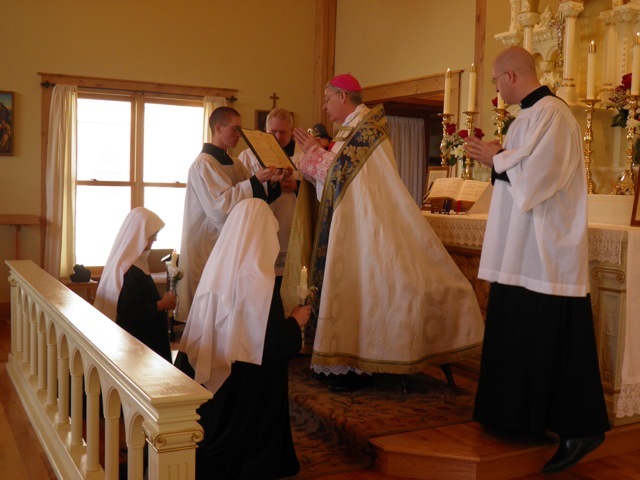 The vows were received by Bishop Robert Finn during a Mass in the Extraordinary Form, the Mass the Sisters feel privileged to have every day. To support their monastic life of prayer and work, the Benedictines of Mary design and create beautiful liturgical vestments, and have recently ventured into the world of musical recording. Last year's release of "Advent at Ephesus" launched the Sisters to the top of the Billboard Charts for Classical Music. 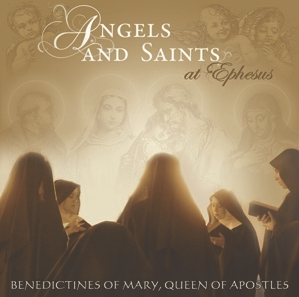 Their new CD recording, "Angels and Saints at Ephesus," scheduled to be released on May 7, 2013 is intended to bring the beauty of sacred music to the lives of its listeners. 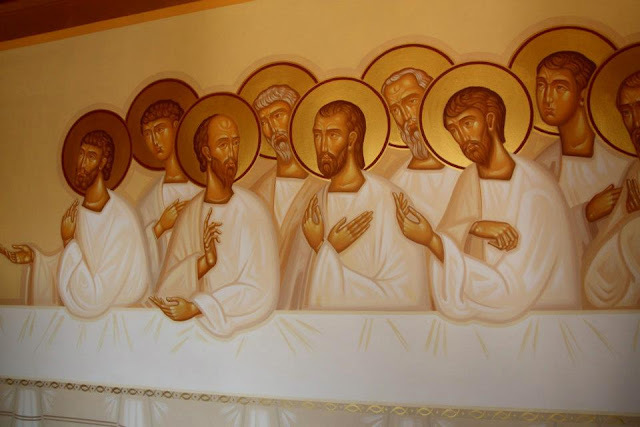 Please visit their website benedictinesofmary.org for more information on the life and work of the Benedictines of Mary, Queen of Apostles, or to order their recordings. 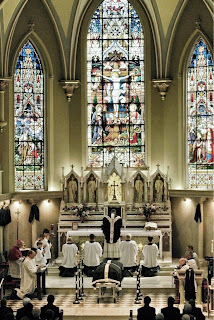 A reader from the Franciscan University of Steubenville sends in these photos of a Solemn Mass offered there on April 21st. The celebrant was Fr. Gregory Plow, TOR, the deacon was Fr. John Larson, MIC, and the subdeacon was Fr. Vicent Huber of the diocese of Steubenville. 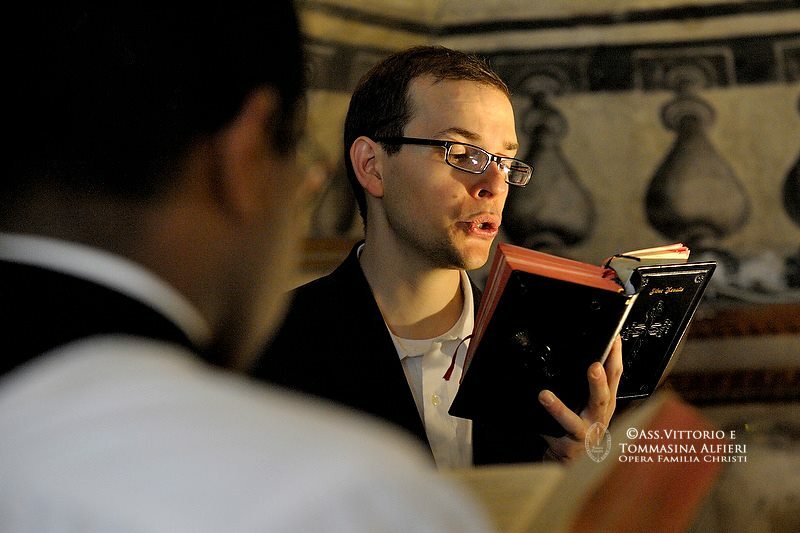 The Schola Cantorum Franciscana provided the music for the Mass, under the direction of Dr. Paul Weber, singing the Mass for Four Voices by Claudio Monteverdi, with motets by Palestrina and Giovanni Croce. Thank you for your presence this evening. Sacra Liturgia 2013 is an event that follows on from the Adoratio 2011 Conference that I organised at the Salesianum in Rome two years ago. Inspired by the Year of Faith called to mark the 50th anniversary of the opening of the Second Vatican Council and following on from the Synod on the New Evangelisation, I wanted to bring together key cardinals, bishops and other noted experts in the liturgy from around the world to underline the fact that formation in the sacred liturgy and its correct celebration is of the first importance in the life and mission of the Church. I would like to emphasise this point: grace has a primacy in all our activities. The liturgy is the continuing action of Jesus Christ in His Church. It is where we encounter Christ and receive the power of the Holy Spirit to strengthen us for Christian life and mission. The New Evangelisation must be founded on the worthy celebration of the liturgy, and for that we need good liturgical formation. 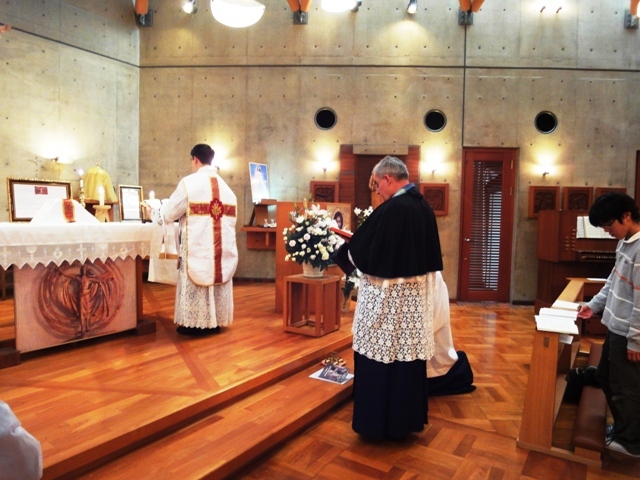 This event was also inspired by the liturgical teaching of Benedict XVI. We are holding the conference in Rome, at the Pontifical University Santa Croce, in order to be close to Peter, and our delegates hope to join with our new Holy Father, Pope Francis, at the Mass of Saints Peter and Paul in St Peter’s Basilica. The conference itself will be a time of shared reflection, study and celebration on different aspects of the liturgy and the mission of the Church. The programme is published on the conference website, but I would highlight the Keynote address of His Eminence Malcolm Cardinal Ranjith: “The Sacred Liturgy, culmen et fons vitæ et missionis ecclesiæ” which will in many ways set the tone for the different and specific presentations that will follow. 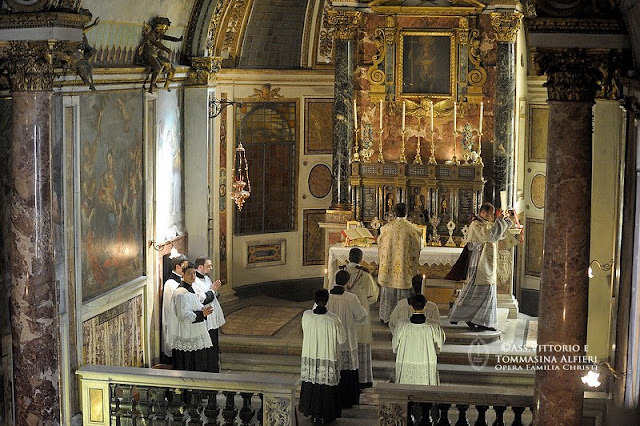 The liturgical celebrations of Vespers and Holy Mass in the Basilica of St Apollinare will be in both forms of the Roman rite: there does not need to be any opposition between the two. The correct celebration of both have their rightful place in the Church of the New Evangelisation. The recently formed Fraternity of St Philip Neri which is at Lewiston in Maine, receives its first novice this coming month. Tyler Tracey will be formally admitted at a ceremony at 5.30pm at the Basilica of Ss. Peter and Paul, 122 Ash Street on Friday May 3rd. It will be followed by Vespers, Adoration and Benediction of the Blessed Sacrament. 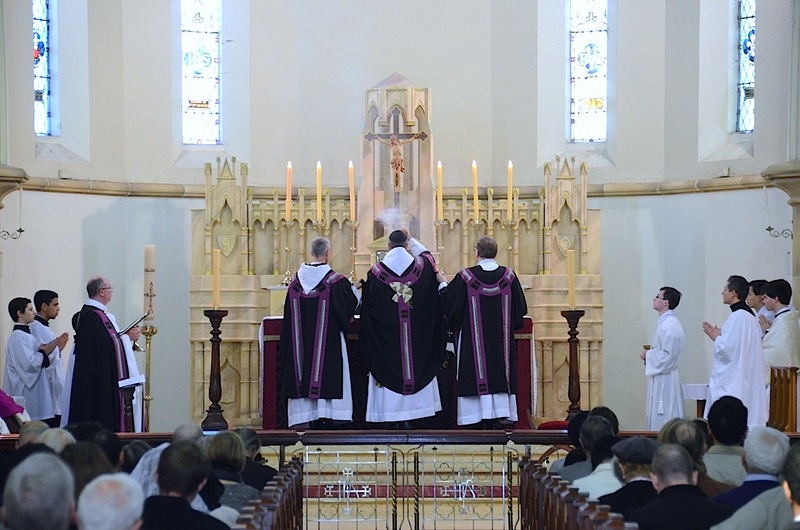 The community formed only last year and as an Oratory in formation they are three priests of the Diocese of Portland, Maine, a private association recognised by the Bishop of the Diocese. Tyler will become the fourth member of the community. I am particularly pleased to hear the news and plan to go myself because Tyler is a graduate of Thomas More College whom I know well. 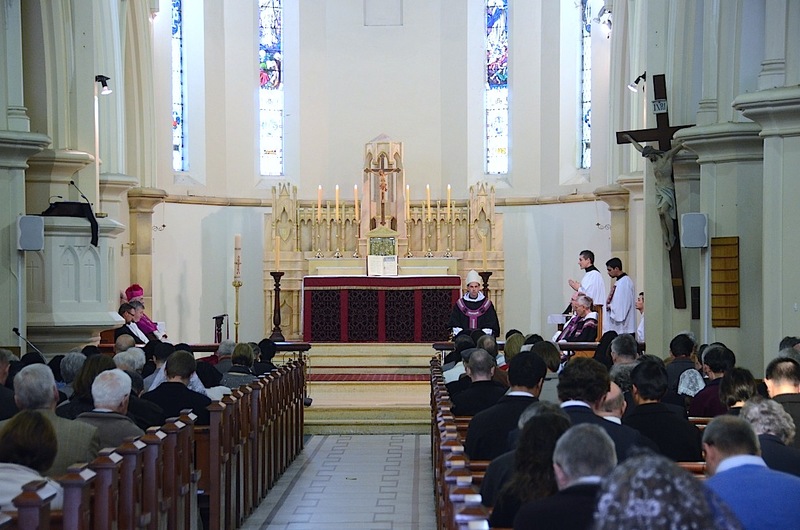 By all accounts the church is a worthy home for a community devoted to beautiful liturgy and I am looking forward to seeing it. I give you some photos from their website.